Liberman responds to Hamas leader's praise of Jerusalem terrorist who killed a baby; Ecuadorian seminary girl still fighting for her life. 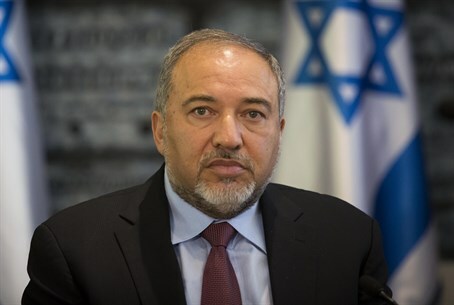 Foreign Minister Avigdor Liberman (Yisrael Beytenu) responded harshly to Hamas leader Ismail Haniyeh, who praised the murder of three-month-old Chaya Zisel Braun hy''d on Wednesday by a Hamas terrorist in Jerusalem. "Next time they ask for us to treat a daughter of Ismail Haniyeh in a hospital in Israel - we'll send them in response Haniyeh's praise of the murder of the baby Chaya Zisel Braun hy''d," declared Liberman. Haniyeh just this month had his daughter treated in Tel Aviv's Ichilov Hospital, less than two months after the recent Hamas terror war that targeted Israeli civilians with rocket and terror tunnel attacks. In fact, several of Haniyeh's relatives have received medical treatment in Israel, including his mother in-law in June and granddaughter last November. Ichilov Hospital confirmed that Haniyeh's daughter, one of 13 children, "was indeed hospitalized for medical treatment for several days at the hospital. Over 1,000 patients from Gaza and the Palestinian Authority territories - both adults and children - are hospitalized for treatment at our hospital every year." The revelation led Ofer Mendelovich, the bereaved father of Golani Brigade soldier Oz Mendelovich hy''d who was killed this past summer in the Gaza campaign, to remark that the treatment of the terror leader's daughter was sheer "stupidity." While Liberman struck out at Haniyeh, Hamas's "unity partner" Palestinian Authority (PA) Chairman Mahmoud Abbas was also getting in on the action of glorifying the terrorist attack. Abbas's senior aide Sultan Abu Al-Einen called the murderer a "hero," and Abbas's Fatah faction likewise pledged "loyalty" to the terrorist. Braun was one of nine injured in the Wednesday attack, with one other teenage girl remaining in serious condition. The victim of the attack, an 18-year-old citizen of Ecuador who was in Jerusalem studying at a religious girls' seminary, remains in critical condition after undergoing head surgery. She is hospitalized at Hadassah Ein Kerem Hospital's urgent care unit, where her parents are to see her Thursday night after being flown in from Ecuador by the Foreign Ministry. Another female victim is still hospitalized as well, suffering from light wounds, and yet another was released home this morning. Jerusalem's Sha'arei Tzedek Hospital has also been treating a female victim of the attack, whose condition was listed between lightly and moderately wounded.